The tree kingfishers or wood kingfishers, family Halcyonidae, are the most numerous of the three families of birds in the kingfisher group, with between 56 and 61 species in around 12 genera, including several species of kookaburras. The family appears to have arisen in Indochina and the Maritime Southeast Asia and then spread to many areas around the world. Tree kingfishers are widespread through Asia and Australasia, but also appear in Africa and the islands of the Pacific and Indian Oceans, utilising a range of habitats from tropical rainforest to open woodlands. 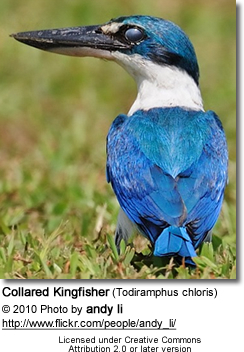 The tree kingfishers are short-tailed large-headed compact birds with long pointed bills. Like other Coraciiformes, they are brightly colored. Most are monogamous and territorial, nesting in holes in trees or termite nests. Both parents incubate the eggs and feed the chicks. Although some tree kingfishers frequent wetlands, none are specialist fish-eaters. Most species a dive onto prey from a perch, mainly taking slow moving invertebrates or small vertebrates. 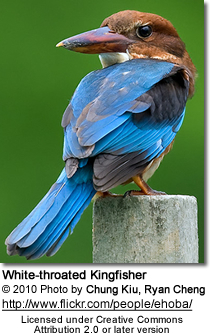 Kingfishers are short-tailed large-headed compact birds with long pointed bills. Like other Coraciiformes, they are brightly colored. The tree kingfishers are medium to large species, mostly typical kingfishers in appearance, although Shovel-billed Kookaburra has a huge conical bill, and the Tanysiptera paradise kingfishers have long tail streamers. 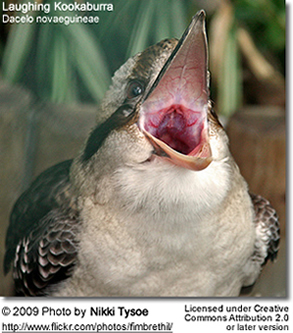 Some species, notably the kookaburras, show sexual dimorphism. 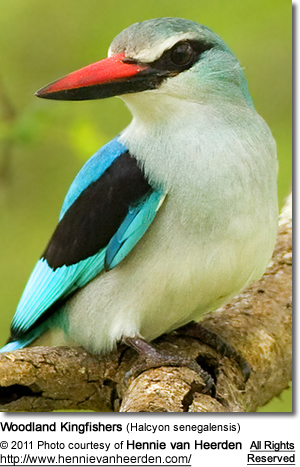 Most tree kingfishers are found in the warm climates of Africa, southern and southeast Asia, and Australasia. No members of this family are found in the Americas. The origin of the family is thought to have been in tropical Australasia, which still has the most species. 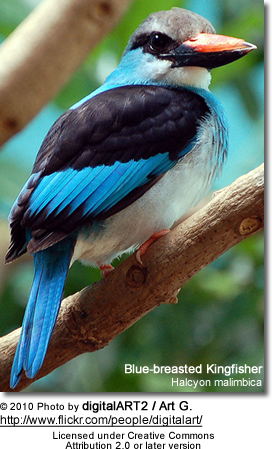 Tree kingfishers utilise a range of habitats from tropical rainforest to open woodlands and thornbush country. Many are not closely tied to water, and can be found in arid areas of Australia and Africa. 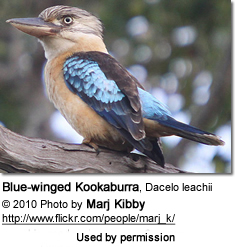 Tree kingfishers are monogamous and territorial, although a few species including three kookaburras have a group nesting system involving young from earlier broods. The nest is a tree hole, either natural, and old woodpecker nest, or excavated in soft or rotting wood by the kingfishers. several species dig holes in termite nests. No nest material is added, although litter may build up over the years. Both parents incubate the eggs and feed the chicks. Egg laying is staggered at one-day intervals so that if food is short only the older larger nestlings get fed. The chicks are naked, blind and helpless when they hatch, and stand on their heels, unlike any adult bird. 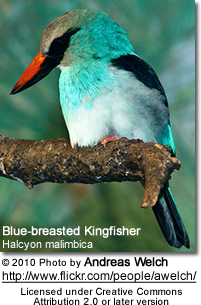 Although some tree kingfishers, such as the Black-capped Kingfisher frequent wetlands, none are specialist fishers. Most species are watch-and-wait hunters which dive onto prey from a perch, mainly taking slow moving invertebrates or small vertebrates. The Shovel-billed Kookaburra digs through leaf litter for worms and other prey, and the Vanuatu Kingfisher feeds exclusively on insects and spiders. Several other western Pacific species are also mainly insectivorous and will flycatch for prey. As with the other kingfisher families, insectivorous species tend to have flattened red bills to assist in the capture of insects. 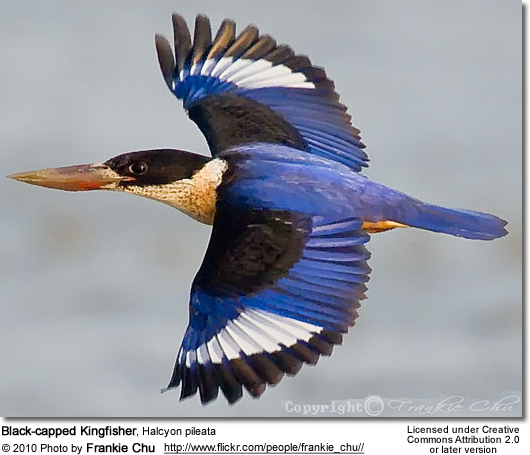 The tree kingfisher family Halcyonidae is one of nine in the order Coraciiformes, which also includes the motmots, bee-eaters, todies, rollers, ground-rollers, Cuckoo Roller and two other families of kingfishers. The rollers do not appear to be particularly closely related to the others groups, and the Coraciiformes are therefore probably polyphyletic. In the past, all kingfishers were placed in the Alcedinidae, but it became clear that the three subfamilies diverged early, and the tree-kingfishers and Cerylidae (water-kingfishers) are usually now treated as full families, with the Alcedinidae being ancestral to these two groups. There are between between 56 and 61 species in around 12 genera. The species in this family are quite well-known: the vagueness of the count reflects controversies in the taxonomy of this family more than any gross lack of data on the birds themselves; the present arrangement of genera seems to be supported by molecular analyses, although the relationship of many genera to one another is still unresolved.